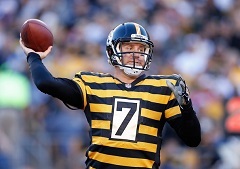 Steelers offensive linemen loved what they saw from quarterback Ben Roethlisberger on Sunday. The smile on Mike Adams face said it all about what it was like for the offensive line during Sunday’s game against the Indianapolis Colts. Not only was quarterback Ben Roethlisberger not sacked, but he became the first quarterback in NFL history to throw for 500 yards in a game twice in a career. When the announcement came across the Heinz Field PA system of that accomplishment during the game, you could see from the offensive line’s reaction that they were pumped. Roethlisberger, who also recorded his 100th regular season win in the 51-34 victory, completed 40 passes for 522 yards and six touchdowns with a quarterback rating of 150.6. Center Maurkice Pouncey joked about it being an okay kind of performance for Roethlisberger, then quickly went on and on about how special a player he is. “He is awesome. He is a Hall of Fame quarterback,” said Pouncey. “He does a great job of leading this team. As you can tell he can make big time plays and have big time games as well. He is awesome. We love seeing big time plays like that. When he has receivers that make the big time catches and plays like that, it all looks great.